Russia has condemned foreign powers for backing a Venezuelan opposition leader who declared himself interim president, calling it a bid to “usurp power”. Moscow said that the move violated international law and was a “direct path to bloodshed”. Juan Guaidó declared himself interim leader on Wednesday – a move recognised by the US and several other nations. Mr Maduro has been in office since 2013. He was sworn in for a second term earlier this month, after winning a May 2018 election marred by an opposition boycott and widespread claims of vote-rigging. Mr Guaidó is the head of the National Assembly, who has said articles within the country’s constitution allow him to assume interim power because he believes Mr Maduro’s election, and therefore presidency, is invalid. He has vowed to lead a transitional government and hold free elections. How has the diplomatic spat flared? US President Donald Trump recognised Mr Guaidó as Venezuela’s new head of state minutes after his declaration in the capital, Caracas, on Wednesday. Mr Trump urged other nations to follow suit – but the move has divided much of the international community. Seven South American nations, as well as Canada and the UK, have now backed his call. Foreign Secretary Jeremy Hunt said on Thursday that the UK agreed that Mr Maduro was “not the legitimate leader of Venezuela”. “The United Kingdom believes Juan Guaidó is the right person to take Venezuela forward,” he said in a statement. The European Union has stopped short of recognition, but called for “free and credible elections” and said Mr Guaidó’s freedom and safety should be respected. China, a major investor in Venezuela, said it opposed any outside interference. Why was Russia so outspoken? Moscow sees Venezuela as one of its closest allies in the region. It has lent billions of dollars and has backed its oil industry and its military. Russia has also taken part in military exercises in Venezuela. Kremlin spokesman Dmitry Peskov said: “We consider the attempt to usurp sovereign authority in Venezuela to contradict and violate the basis and principles of international law. A Russian foreign ministry statement said Mr Guaidó’s declaration was a “direct path to lawlessness and bloodshed”, adding: “Only Venezuelans have the right to determine their future. Russia also warned that any US military interference would amount to “adventurism which is fraught with catastrophic consequences”. He was asked about military intervention and while he said he was not considering it, he added that “all options are on the table”. It warned Mr Maduro tougher sanctions could be imposed. The US has urged the Venezuelan military to back Mr Guaidó, but so far it has remained loyal to Mr Maduro. What was President Maduro’s response? He accused Washington of trying to govern Venezuela from afar and said the opposition was seeking to stage a coup. “We’ve had enough interventionism, here we have dignity, damn it!” he said in a televised address from the presidential palace, the Miraflores, where his supporters gathered to back him on Wednesday. The country’s Defence Minister, Vladimir Padrino Lopez, has accused Mr Guaidó of trying to launch a “coup d’etat” driven by foreign powers. On Wednesday Mr Maduro gave US diplomats 72 hours to leave the country, but the US said the “former president” no longer had the authority to order them out. Mr Maduro and his core supporters believe Venezuela’s problems are caused by US sanctions that have hampered the government by making it hard to restructure its debt. How did Mr Guaidó’s declaration come about? Mr Guaidó became president of the opposition-controlled National Assembly this month. The opposition took power there after elections in 2015, but in 2017 Mr Maduro set up a separate body, the constituent assembly, which is filled with his supporters. Both chambers are meeting and passing laws but the constituent assembly is the only one whose laws are being enacted by the government. 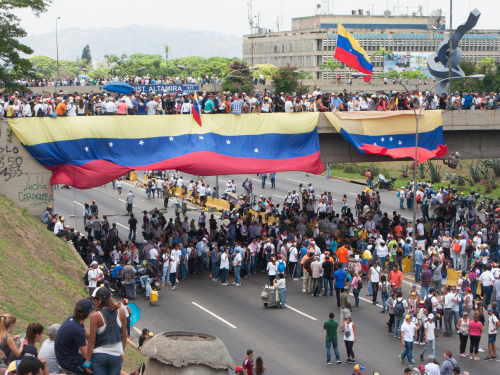 Tens of thousands of Venezuelans took to the streets to rally in support of Mr Guaidó on Wednesday – while others demonstrated in favour of Mr Maduro. Mr Guaidó has cited articles 233 and 333 of the constitution which allow him to assume interim power in the absence of the president. He argues Mr Maduro is not president because the elections are invalid. Venezuelan NGOs said that 14 people were shot dead during protests on Tuesday and Wednesday. The country has been in economic freefall under Mr Maduro. Hyperinflation, power cuts and shortages of basic items have driven millions of people from the country.